Our complete range of electric (pneumatic and cushion tire) forklift trucks deliver controllable, programmable performance for the safe handling of different loads. 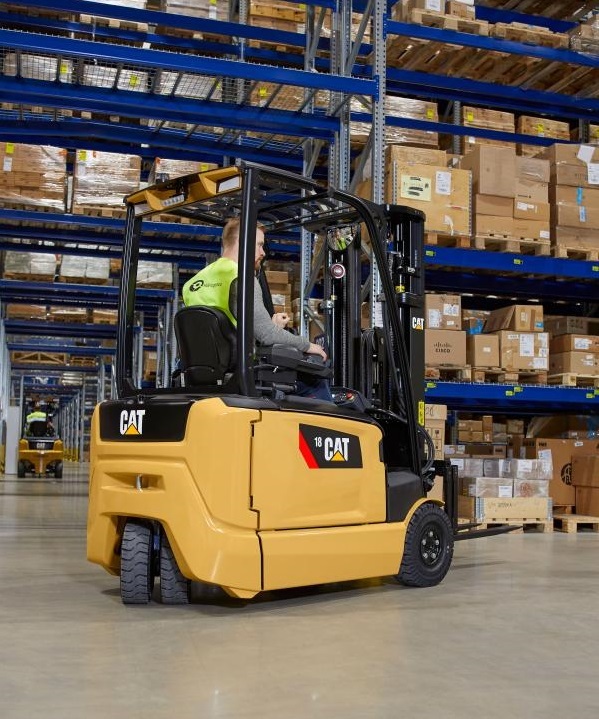 With a range that includes 48V 3- and 4-wheel workhorses and heavy duty 80V machine’s, Cat Lift Trucks boast one of the most modern and complete product ranges in the industry. Designed to deliver a highly productive work environment and reduced operator fatigue, common features include: a low step height; comfortable compartment, seat and controls; generous leg room; optimal instrument display panel; full or partial cabin options and extremely quiet operation. The Presence Detection System also encourages safer working. 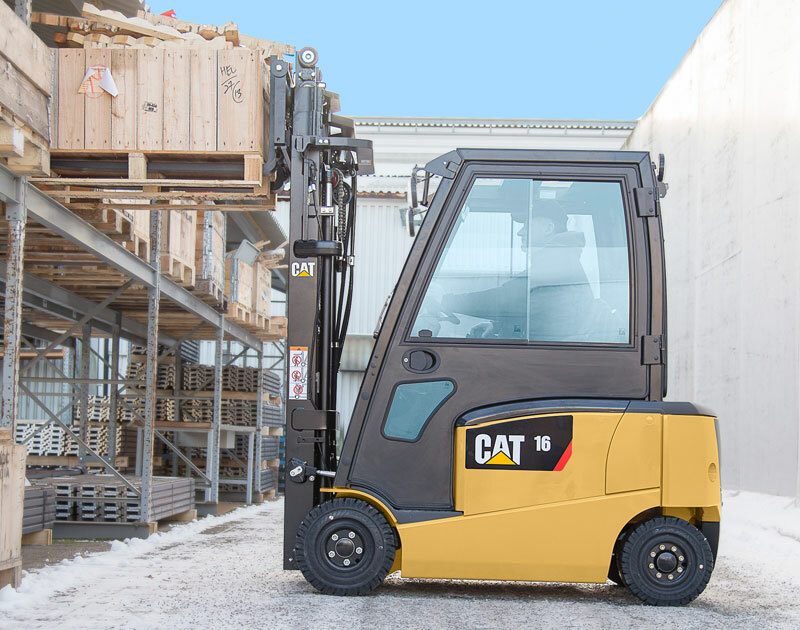 At the very forefront of intelligent lift truck technology, the new EP14-20AN compact range of electric forklifts from Cat® Lift Trucks offers a great deal in a small package. 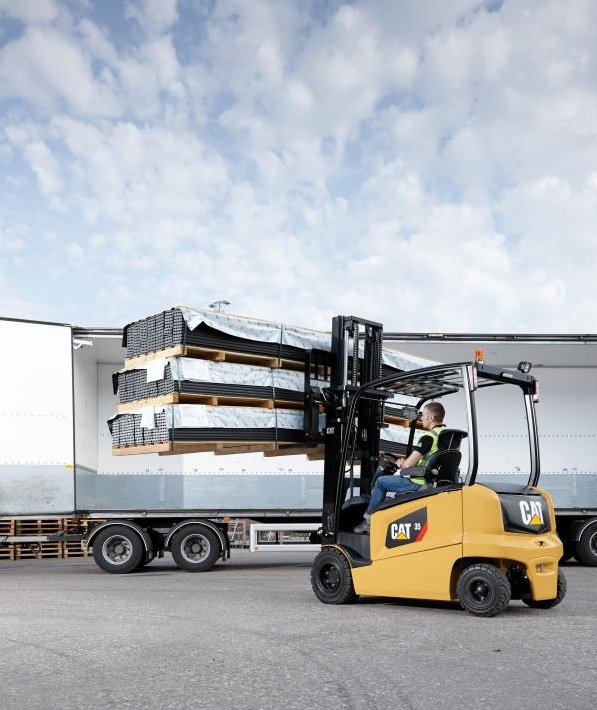 Imagine a forklift that ‘reads’ how the driver is operating the controls and then automatically adjusts its behaviour to optimise stability, safety and comfort. A fork truck that calculates and controls its fastest safe speed in any scenario, whilst preventing tilting or load imbalance to maximise productivity and driver comfort. A truck whose intelligent systems not only elevate productivity, but also operate more efficiently whilst pro-actively creating a safer environment for employees. 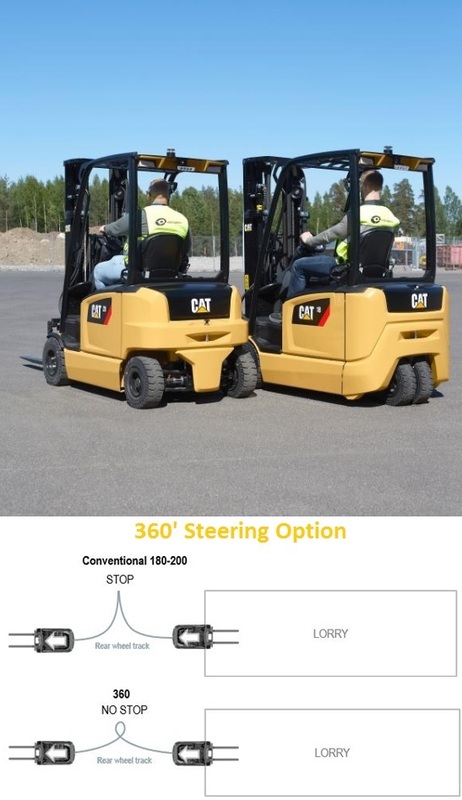 Well, not only does this technology exist, but thanks to Cat Lift Trucks it now comes as standard on a range of compact electric machines that won’t break the bank and can even operate in demanding conditions, both inside and out. Developments in sealing technology have been applied across numerous components to endow the tech-laden trucks with incredible durability that allows them to operate in the harshest of wet, dirty and dusty environments. Our new range of efficient and versatile 3 and 4- wheel, 48V electric trucks are available with lifting capacities from 1.4 – 2.0 tonnes. With their compact design, amazing manoeuvrability and intelligent control systems, these trucks are the automatic choice when space is tight. Ideal for efficient handling in containers, lorries, drive-in racking and other cramped, fast paced environments, their behaviour rapidly adapts to changes in drivers’ wishes and needs. Manoeuvrability is smooth and agile thanks to the trucks dual drive ‘4-wheel steering’. A +100° rear turning axle allows this forklift to be driven sideways without having to push back first. For even greater agility in turning, there is a 360° steering option. This allows the truck to turn and move in the opposite direction (180°) without stopping, and avoids destabilising the load. These high powered electric lift trucks range from 2.5 to 3.5 tonnes. They come with a high standard specification which includes – Presence Detection System+ (PDS+), maintenance-free wet disc brakes and IP54 sealing of main components and are designed to cope with intensive duties and tough conditions. They are a pleasure to drive due to their agility, intelligence and comfort. All of our electric counterbalance trucks can be fitted with cabins to suit your application. We would be happy to provide you with more details.